When slimy lotions and cold sprays don’t sound very enticing for kids, ease them into sun protection with non-sunscreen items. Hats, sunglasses, and UV-protective clothing like rashguards can help cover up skin areas that may be exposed and cut down on sunscreen application areas. Applying sunscreen is useless if you’re not using the right ones. What type of sunscreen is best for you and your family? First, look for broad spectrum sunscreen. Broad spectrum means it protects against UVA and UVB radiation rays. The UVA rays can cause premature aging, wrinkles, and damage that can lead to skin cancer. The UVB rays can cause your skin to burn. Check out the sunscreen label for both kinds of protection. SPF – or “Sun Protection Factor”- is a measure of how well a sunscreen protects your skin from the kind of UVB rays that cause sunburn. Experts recommend a minimum of SPF 30 as it blocks 97% of the UVB rays when applied (and re-applied) correctly. 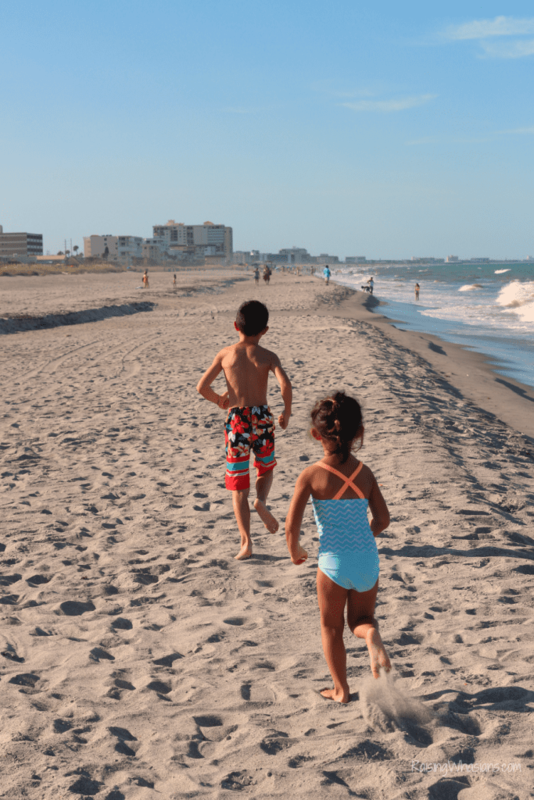 Growing up in Florida, my kids know that in order to go swimming, you have to wear sunscreen. They don’t know anything different. Start early and make it a habit. You won’t have a struggle if they expect sunscreen before play time. Unlike most instances in parenthood, sunscreen application is one thing you really shouldn’t delay. Ideally, you should apply sunscreen 30 minutes before sun exposure. In some cases, that means applying before you leave home. This is actually beneficial for all parties. 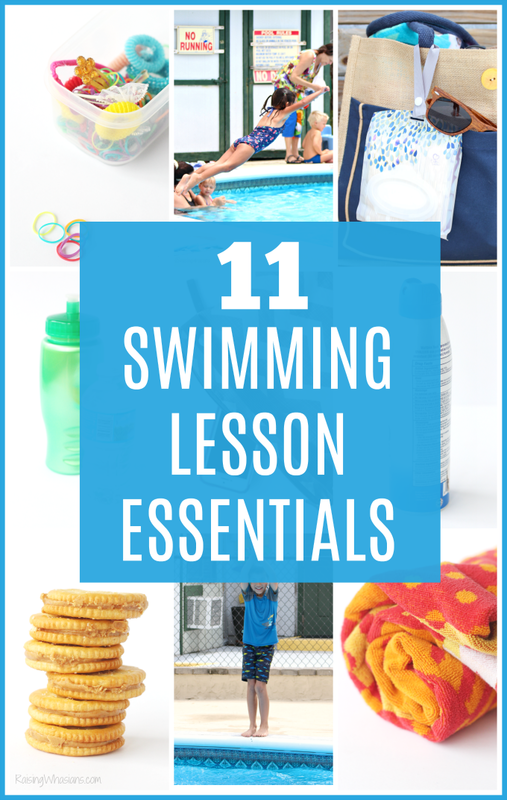 Give them something to look forward to (like swimming lessons) so when they get to their sunny destination – they can jump right in! Sunscreen choo-choo train – you sunscreen my back and I’ll sunscreen yours. Make a train of people to apply that sunscreen, perfect for families! Holding your breath – Using spray? Have a contest to see who can hold their breath the longest while applying sunscreen! 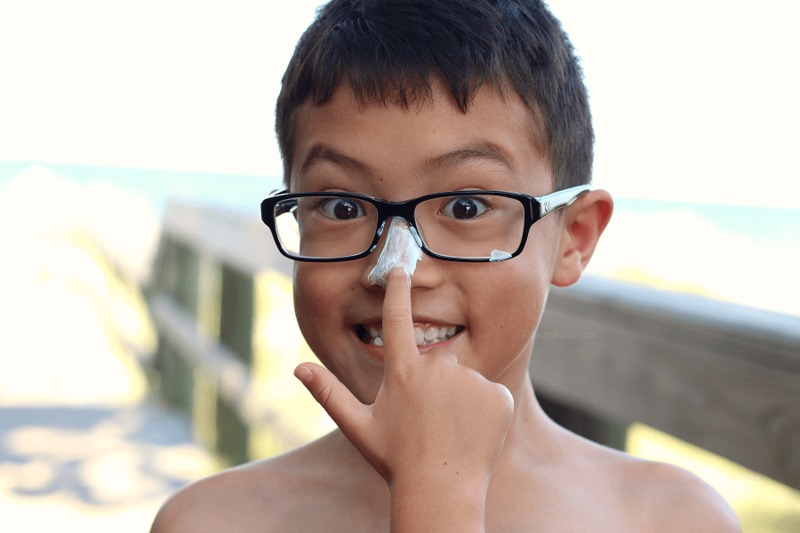 Singing and dancing – musical sunscreen application? Sure! Little Teapot concert, of course! 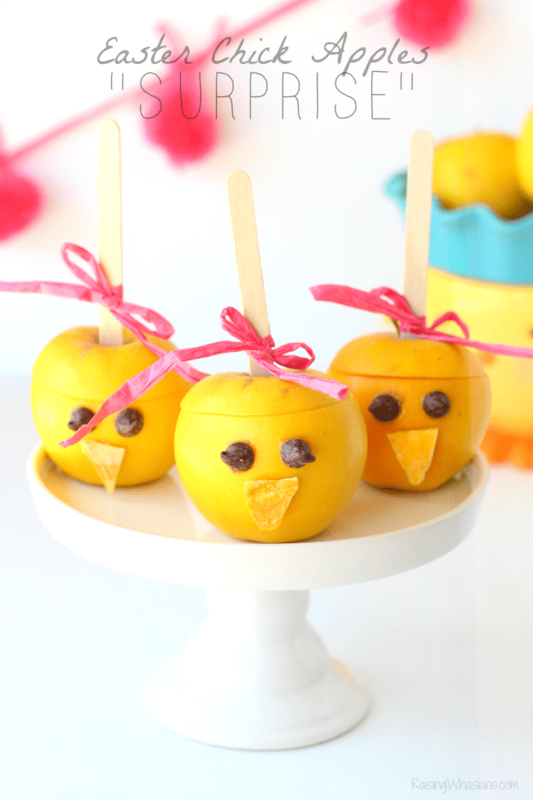 Encourage your kids to ham it up for the sunscreen – with a special show just for you! It’s hard enough to keep up with babies and toddlers, especially when on the move! One tip that I used when my kids were little was to make sure I applied baby sunscreen while they were strapped in their car seats. Can’t sneak away from me then! And don’t forget, sunscreen isn’t recommended on babies under the age of 6-months old. Check with your pediatrician for sunscreen alternatives and recommendations for babies younger than 6-months. Got a speedy kid? Me too! If you’re looking to speed up the sunscreen process, definitely consider spray vs. lotion. Remember to never spray sunscreen directly on a child’s face. Spray it on your hands and then apply it to his/her face. Have children hold their breath when you spray sunscreen on their body, and close their eyes. Spraying alone isn’t enough for full protection. Don’t forget that once you spray, rub it in well! I always use a little strategic planning when it comes to reapplying sunscreen – like pairing with a snack break, a sitting activity or yes, even a little screen time. This gives you time to sneak in another sunscreen application and drying time. I always keep a timer on my phone to signal when it’s time to reapply – always easy to forget when you’re having fun. Keep in mind that sunscreen needs to be re-applied AT LEAST every 2 hours or more frequently if you are getting wet or sweating. Make sure to read the label because it will specify how long the sunscreen will remain water-resistant. And with high outdoor activity, a good rule of thumb is to reapply sunscreen every hour of play, just to be on the safe side. Have enough sunscreen? It can be hard to estimate the amount that you need for a day of fun in the sun. Keep the 1 ounce rule in mind. You need about 1 ounce (the size of a golf ball) per person. So if you only have a 3 ounce bottle for 4 people – you’re going to need more. And if you’re planning on reapplication, you’re going to need much more! Plan accordingly for your day to make sure that you have enough sunscreen for everyone. Play time in the sun can be unplanned – and that’s totally ok! Always be prepared for unexpected sun time by having sunscreen on hand for last minute plans. Consider keeping a sunscreen stick or wipes in your purse, car, or diaper bag just in case. I always keep extra hats and rashguards in the car too! Kids are challenging. 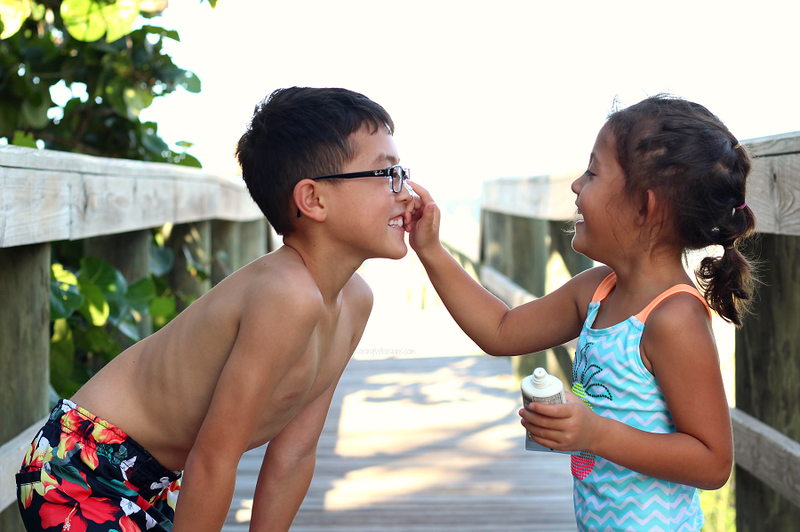 Trying to get kids to wear sunscreen and reapply can be even more challenging. But hopefully these tips can make the application process just a little bit easier. 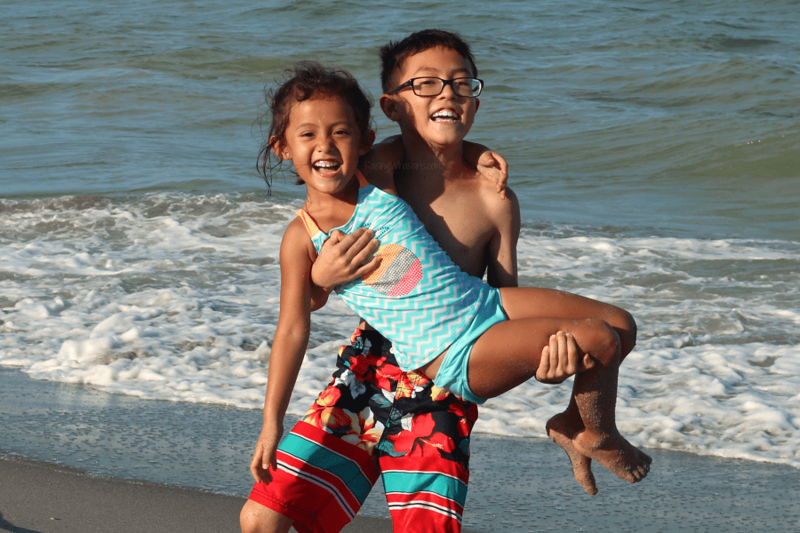 Stay safe this summer and keep those precious kids protected with these tips to get kids to wear sunscreen! Grab more sunscreen and sunburn treatment tips at KnowYourOTCs.org. Looking for more parent tips? Wearing sunscreen is very important. Thanks for the tips! Chasing down kids with a bottle of sunscreen can almost feel like child abuse they way they react. I love your advice- make sure to make it a habit early on. Very good advice! !